Yesterday, James had 14 Blackwits and a Ruff on the floods at Gruinart and a count of 230 Pale bellied Brent out on Loch Gruinart itself. This morning, on the floods, James counted 798 Greylags (1 with a neck collar on), 3 Barnies and also 4 Pintails. Bob counted a total of 185 Pale bellied Brent out from the new hide at Gruinart. Late morning, we saw 7 Herons sheltering up from the wind in some rushes between Bun an Uillt and Craigens. This afternoon, we had 8 Whoopers flying South out over the machir out towards the War graves cemetery. Today, Bob had seen both Whinchats and Stonechats on Bolsay Moor, James had 7 Blackwits on the floods at Gruinart with Phil down on the Oa seeing a Wheatear, a male Hen Harrier and a Merlin. Back on Saturday, Lesley had a passage of between 60 - 70 Swallows fly past her house close to Carraig Fhada over at Port Ellen. 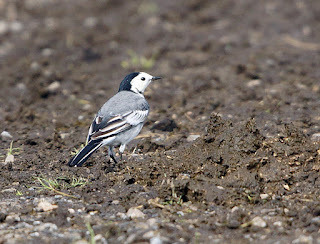 She also saw 30 Pied Wagtail including 2 White Wagtails, a small number of Sanderling and Dunlin and a female Merlin. Today, Lesley had 2 Ruff at Kilnaughton Bay. She was also saying that someone had a pod of 12 Dolphins in the bay just before miday. James this morning, over on Loch Gruinart had 3 Barnacle Geese, 9 Grey Plover, 1 Little Stint, a Curlew Sandpiper and also a Merlin. Today, Gary braved the elements and carried out his WeBS count from Port Charlotte back along Loch Indaal to Blackrock. His birds were as follows, 2 GND, 1 RTD, 10 Cormorant, 1 Razorbill, 2 Common Guillemot, 11 Eider, 22 Common Scoter, 16 Oystercatcher, 78 Ringed Plover, 20 Dunlin, 7 Turnstone, 3 GBB Gull, 77 Herring Gull, 29 Common Gull, 17 Gannet, 1 Curlew Sandpiper, 2 Comic Tern and a Merlin. Gary had also noted several large flocks of Linnets between his house, outside Ballygrant, and Bruichladdich. On Tuesday evening (27th Sept), the bird nerds will be meeting up at the Visitor centre at RSPB Loch Gruinart at 7.30pm, so if you are around feel free to come along. Yesterday, Gary had a Kestrel out in front of his house and then shortly afterwards a ringtail Hen Harrier out over the moorland, behind his house. Today, Gary and Bob had been out round the Loch Gorm area noting lots of Meadow Pipits, Skylarks and Stonechats present along with a second year male Hen Harrier, a ringtail Hen Harrier and also a juv. Peregrine on a fence near to Saligo. On Loch Gorm itself, they saw 4 Dabchick, 100 Teal, 30 Tufted Duck, 25 Mallard and 7 Heron. 6 Buzzard were counted on their way round the loch! Late afternoon, at the top end of Loch Indaal, Louise had a count of 152 Red breasted Merganser, lots of Oystercatcher, 2 Pale bellied Brent, Barwits present as were Wigeon, Teal and Pintail. 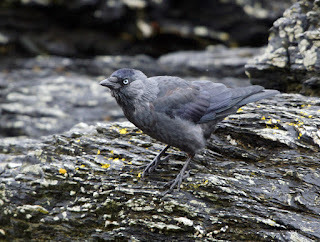 Many thanks to Jim Dickson for sharing his sightings with us while he has been over for the last fortnight or so. Many thanks to James for writing the blog while I was over on the mainland over the past 10 days or so. On Monday (19th) Jim's top birds included 6 Black Guillemot off Bruichladdich Pier, a GND in summer plumage on Loch Indaal, and off the rocks at Port Charlotte 65 Common Scoter. Up at Craigens/ head of Loch Gruinart, the Greenland White fronted Goose was still present amongst the Greylags as well as 31 Pale bellied Brent Geese. At Bowmore, Jim had a further 12 Pale bellied Brent and also 80 Tufted Duck. Finally at Machir Bay, Jim heard a Water Rail in the reedbed there. Mandy saw a Barn Owl on a fence post close to the former Kilchoman school last night and earlier on had spotted a Barnacle Goose down at "smelly corner". Yesterday, Bob and Jim had seen 5 Pale bellied Brents and also a Greenshank, 35 Pied Wagtail and a juv. Peregrine at the head of Loch Gruinart. Up at Gortantoid, they saw 4 Yellowhammer, 2 Song Thrush and 6 Reed Bunting. At Rockside, a male Sparrowhawk was spotted. Out over the crag behind Kilchoman, 2 adult and a juv Peregrine as well a single Wheatear. At Ballinaby, 250 Linnets and 70 Rock Dove were counted, up round in the scrubby willow past Coille, 60 Lesser Redpolls with a distant Golden Eagle seen up at Sanaigmore. Today, in the rain/ squally showers, Bill Allan from the mainland had been out with Jim and they had a covey of 16 Red legged Partridge near to Skerrols, Bridgend. On Monday (19th) Jim's top birds included 6 Black Guillemot off Bruichladdich Pier, a GND in summer plumage on Loch Indaal, and off the rocks at Port Charlotte 65 Common Scoter. Up at Craigens/ head of Loch Gruinart, the Greenland White fronted Goose was still present amongst the Greylags as well as 31 Pale bellied Brent Geese. At Bowmore, Jim had a further 12 Pale bellied Brent and also 80 Tufted Duck. Finally at Machir Bay, Jim heard a Water Rail in the reedbed there. Mandy saw a Barn Owl on a fence post close to the former Kilchoman school last night and earlier on had spotted a Barnacle Goose down at "smelly corner". Yesterday, Bob and Jim had seen 5 Pale bellied Brents and also a Greenshank, 35 Pied Wagtail and a juv. Peregrine at the head of Loch Gruinart. Up at Gortantoid, they saw 4 Yellowhammer, 2 Song Thrush and 6 Reed Bunting. At Rockside, a male Sparrowhawk was spotted. Out over the crag behind Kilchoman, 2 adult and a juv Peregrine as well a single Wheatear. At Ballinaby, 250 Lapwing and 70 Rock Dove were counted, up round in the scrubby willow past Coille, 60 Lesser Redpolls with a distant Golden Eagle seen up at Sanaigmore. Today, in the rain/ squally showers, Bill Allan from the mainland had been out with Jim and they had a covey of 16 Red legged Partridge near to Skerrols, Bridgend. Back on the 9th of September, Dave Wood had seen 2 European Storm Petrels and also a Sooty Shearwater from the ferry as he went over to Kennacraig. 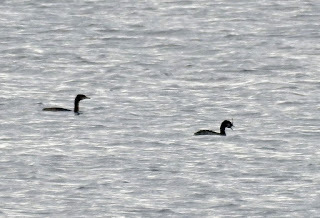 On Saturday, Jim Dickson had seen 3 Slavonian Grebe, 38 Common Scoter, on Loch Indaal out from Uiskentuie. Along at "smelly corner", Jim had 3 Little Stint and a Curlew Sandpiper and out from Bowmore, 67 Barwits, 44 Knot and 181 Wigeon were present. Finally, up at Loch Gruinart, 79 Lapwing, 71 Barwits, 18 Blackwits, 17 Heron and 2 Arctic Tern were counted. A Greenland Whitefront was seen amongst the flock of Greylags at Craigens. This afternoon, David wood had seen a Lapland Bunting flying over amongst some Meadow Pipits down at Glen Astle. Labels: Curlew Sandpiper, Greenland White-fronted Goose, Lapland Bunting, Little Stint. Some sightings from Friday from Gary. At the top of Loch Indaal towards Bowmore he counted over 30 Redhank, 131 Barwits, 3 Knot and a Ruff. Gary also got the impression that there were more Gulls around as well. Michal had carried out the WeBS count yesterday. The "scores on the doors" were as follows, Ardnave Loch, 2 Mallard, 18 Wigeon, 11 Mute Swan, Loch Gruinart held 99 Oystercatcher, 83 Ringed Plover, 10 Golden Plover, 10 Lapwing, 50 Sanderling, 370 Dunlin, 311 Curlew and 36 Redshank. The Floods held 43 Mallard, 131 Teal, 4 Shoveler, 5 Wigeon, 2 Moorhen, 2 Heron, 49 Lapwing and 15 Greylags. Some records from Jim for Yesterday (Thur 15th) 44 Collared Doves and 250 starlings at Octofad, 103 Tufted Duck, 1 Greater Scaup and 115 Teal at Loch Gorm. 80 mostly Pied Wagtails at Machir Bay, 11 Golden Plover and a Sparrowhawk at Ballinaby. At Gruinart a Sparrowhawk, 300 Swallows, 400 Starlings and 60 Goldfinches. On Loch Gruinart 4 Pale Bellied Brents, 18 Black Tailed Godwits, 1 Little Stint and 1 Arctic Tern. At Ardnave Loch 8 Black Tailed Godwits and 2 Bar Tailed Godwits. Today on the Gruinart Floods, I had 43 Mallards, 131 Teal, 4 Shoveler, 5 Wigeon, 2 Moorhens, 49 Lapwing and 2 Whooper Swans and also 2 Corncrakes reported by Neil. 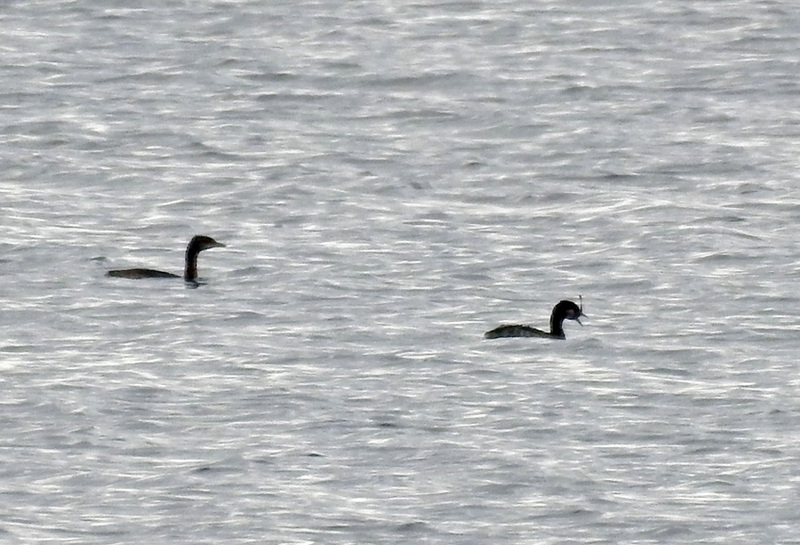 Some records from yesterday (14th Sept): Jim had 14 Red Throated Divers, 41 Common Scoter and 6 Slavonian Grebes on Loch Indaal and Peter had 13 Common Scoter on Loch Indaal from Bruichladdich. At Portnahaven Mary had a Chough battling it out with a Hen Harrier and a solitary Brent Goose, and on Loch Gorm an Osprey. 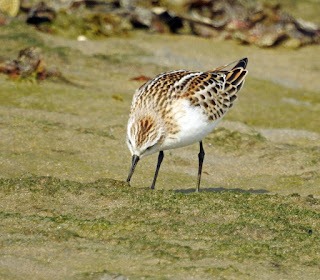 First some records from Yesterday (Tues 13th) Bob and Jim were out at Gartbreck: 1 Little Stint, 1 Curlew Sandpiper, 3 Pale Ballied Brent geese, 3 Knot, 70 Dunlin, 1 Golden Plover, 4 Lapwing, 6 Greenland Wheatears and 5 White Wagtails. On Loch Indaal: 2 Red Throated Divers, 55 Common Scoters, at Uiskentuie an Osprey, Off Bridgend 2 Knot, 47 Redshank and 6 White Wagtails. At Loch Gruinart : 18 Pale Bellied Brent geese, 5 juv Shelduck, 2 Curlew Sandpipers, 1 Little Stint, 36 Black Tailed Godwits, 1 Whimbrel, 8 Greenland Wheatears and 10 White Wagtails. also 5 Snipe, 4 Skylarks, and 50 Linnet. A beautiful day on Islay- unfortunately I have been at an office desk all day (and still am). So I do not have to much to report. Still 14 Pale Bellied Brents on Loch Gruinart and a Sparrowhawk and an Osprey flying around at lunch time. A very windy start to the day, then at lunch time the wind dropped and the rain came on- with a few midges for good measure. Some records from yesterday: Jim had a female Sparrowhawk at Kilchiaran, a Peregrine at Bridgend merse, 18 Bar Tailed Godwits, 72 Lapwing, 2 Whooper Swans on Gruinart Flats, 14 Pale Bellied Brents on Loch Gruinart and 65 Tufted Ducks, 1 Greater Scaup and 7 Teal on Loch Gorm. 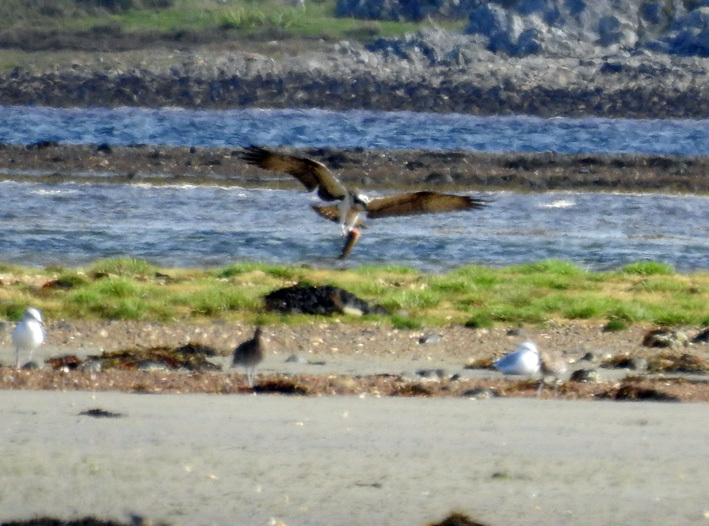 Some records from Gary: on Friday an Osprey on Loch Indaal nr. Whin Park entrance and on Saturday Pale Bellied Brent geese still at Kilnaughton and a Golden Eagle at Ballimartin. The only record for today was a Sparrowhawk in my garden at Gruinart. Lots of records from Jim again, making the best of good Saturday weather before the wind gets up tomorrow. At Bruichladdich 1 Arctic Tern. 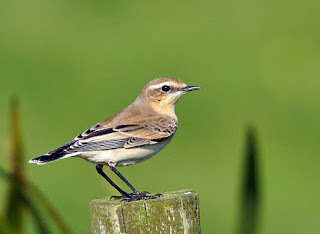 At Craigens 12 Greenland Wheatears and a Whinchat. At Gruinart 2 Peregrines, 1 Osprey, at least 4 Little Stints, 2 Curlew Sandpipers, 2 Greenshank, 84 Redshank, 4 Golden Plover, 3 Whimbrel, 39 Bar Tailed Godwits, 4 Wheatears. At Ardnave Loch 10 Wigeon, 1 Little Grebe and at Octofad a Peregrine. Pictures Osprey and Little Stint from Jim. Rather a blustery day with strong winds blowing this evening. Gary this morning had seen 2 Pale bellied Brent Geese over at Port Ellen, along with a mixed flock of Dunlin and Ringed Plover. Along at the pontoons, Gary counted 3 GGB Gulls and also 45 Herring Gulls resting up. Returning from Port Ellen along the low road, Gary had several small flights of Snipe over the road. Jim Dickson arrived over today for his "Islay September stayover". On the ferry coming over Jim had a Pomarine Skua and saw the Brents when he arrived at Port Ellen. Over the sewage/ water treatment works on the edge of Bowmore, Jim counted 15 Sand Martins and also lots of Swallows. At "smelly corner", Jim had 2 Arctic Terns, 4 White Wagtails and 6 Knot. Along at Uiskentuie, close in to the shore, he had a Manx Shearwater. Up at Gruinart, he counted 29 Blackwits, 8 Barwits, 2 Curlew Sandpiper, 2 Greenshank and 53 Pale bellied Brent as well as, at least 15 Greenland Wheatear. Finally, Jim had seen 60 Goldfinch at the Coull farm road end and then a female Sparrowhawk over the wee wood at Kilchoman. This afternoon, Bob had spent some time in the new hide at Gruinart where he saw 2 drake Pintail in eclipse plumage, 10 Wigeon, 3 Shoveler and 80 Teal. James had seen at Osprey at Gruinart on his return yesterday afternoon and this morning, Mandy had seen a ringtail Hen Harrier at the far end of the flats at Gruinart, towards the turn off to Craigens. amongst the large flock of Greylags that were on the barley stubble at Rockside this evening, there is a Greylag with a lot of white plumage, certainly not a farm yard goose. The most recent figures for Greylags on Islay are around 2,500 counted, with a large proportion around Rockside on the stubbles and silage aftermaths. These geese are not here on Islay all the time but have been possibly come across from Tirree, Colonsay and even the Mull of Kintyre to swell our numbers for a wee while at present!!! 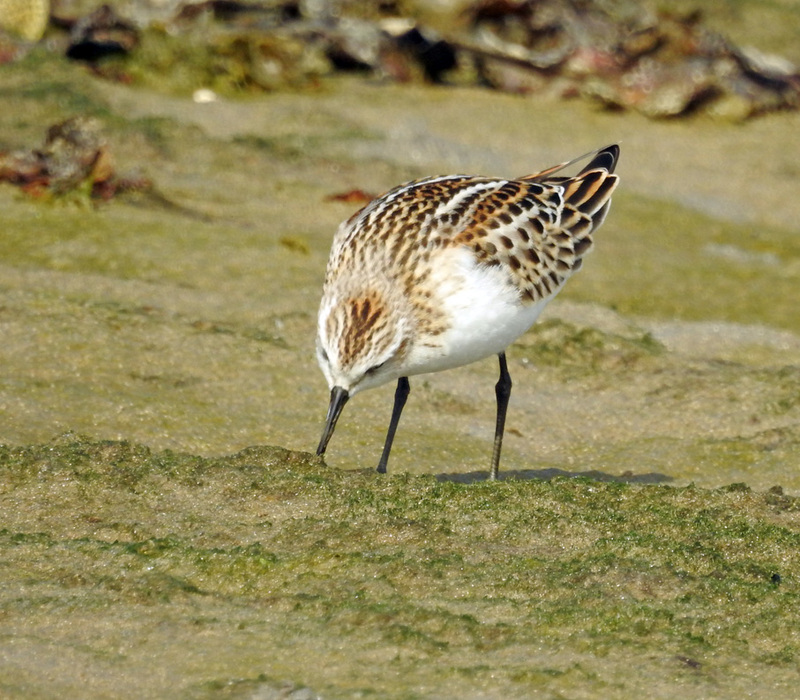 Yesterday, visitors to Islay had seen 3 Curlew Sandpipers up at Ardnave. 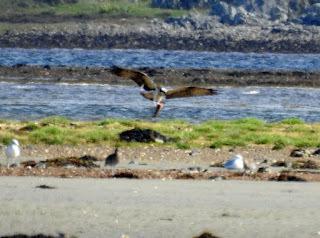 Gary, this morning had seen 3 different Ospreys at Bridgend and the head of Loch Indaal. Michal had a ringtail Hen Harrier over the flats at Gruinart this morning. Late evening, last night I counted 24 Swallows out above the game crop. If you were wondering who A.N. Other was who saw the Marsh Harrier with Paul Graham yesterday, well after a bit of detective work, we can now let you know that it was Eilidh Reid who was a "vol" at Gruinart a few years ago! This morning I had a new house bird, yes as it was sitting on top of the roof, rather than chasing the birds through the garden, the said Sparrowhawk is on the list now as well as on the garden list as well.... This afternoon, we had a Swallow in the house, another for the house list!!! The cats had a squint as it, and they both fell asleep soon afterwards.... Bob and Gary saw the Sedge Warbler down on the game crop today as well, but a much closer viewing than James had of it yesterday. As we came home, earlier this evening, there was a juv. Fulmar on the road down close to Sunderland, so I caught it up and took it down to the sea where it should have been, rather than waiting for a passing car to run over it. At Saligo Bay yesterday evening, we counted 17 Pied Wagtail going in to the reed bed. 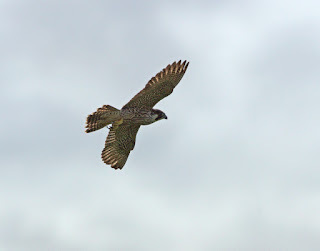 Earlier on, mid afternoon, Margaret had seen a Peregrine on top of Carraig Dhubh out on Loch Indaal out from Blackrock. Today, the Peregrine was seen on Islay, at Blackrock on a kill/ remnants of a rabbit, before it took off carrying its' prey. This afternoon, the Marsh Harrier was seen again, this time down on the South side of Loch Gorm by Paul Graham + A N Other. Late afternoon, and James had spotted a Sedge Warbler flit through the game/ cover crop here at home. Yesterday Mike Peacock had seen his first GND of the Autumn, off Port Charlotte! Today he had done another sea watch down at Frenchman's rocks with Peter. Highlights included a Balearic Shearwater, 465 Manxies and 8 Sooty Shearwater during a 2 hour stint. 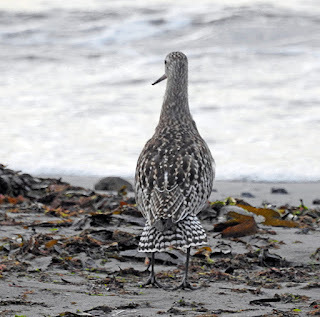 Yesterday, Gary had seen a large group of Redshank on the exposed shore, due to the low tide, out from the Generating Power station at Bowmore. Along at the Gaelic College, Gary counted 42 Knot, 12 Curlew and 4 Whimbrel. Today, from the Gaelic College, he counted 52 Knot, 22 Curlew, 4 Whimbrel and 20+ Redshank. Out from "smelly corner", Gary had 40 Teal, 400 Dunlin, 250 Ringed Plover, 1 Turnstone and 5 Sanderling. Out on the old shipwreck on the exposed mud, an Osprey perched there for some time! Nothing much to report today but yesterday Louise had counted the Greylags around Loch Gorm with her tally coming through at just short of 1200, James had a count of 300 at Gruinart while Michal saw none on his route round Ardnave! The tally for the rainfall for August was 4.25 inches while the tally over at Mulindry was 5.75 inches. Perhaps our rain does get the chance to fall into the gauge on some of the windy days.... Our tally for the year so far coms to just short of 32 inches.